Can the Sari continue to be a practical and elegant choice for most Indian women? 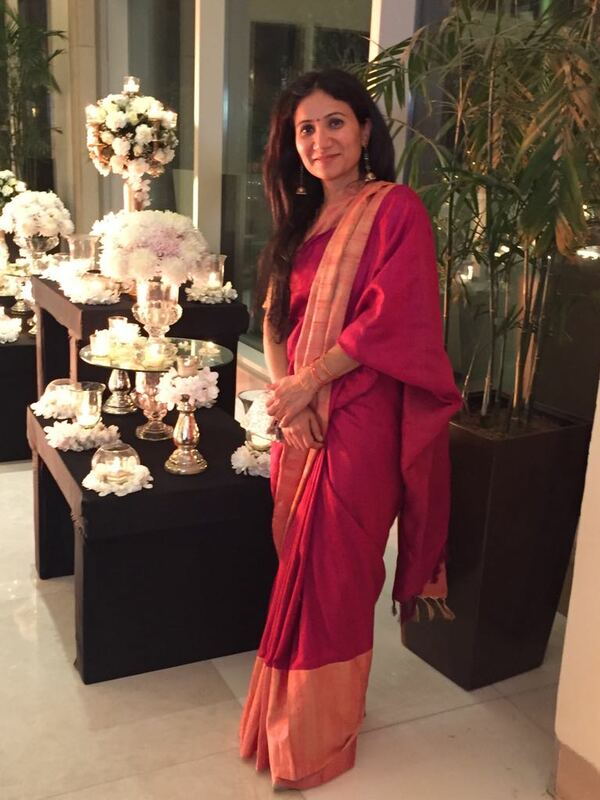 The author, in a silk sari, at a wedding, recently in India. Second week of February Sabyasanchi, the famous Indian designer, speaks at a Q&A session in the India conference in Harvard says that it is a shame for someone (of Indian origin) to not know how to wear a sari, citing the sari as an important part of the Indian cultural heritage. Immediately the twitter world goes abuzz with angst over what are considered seriously misogynistic and rather patriarchal remarks. Sabyasanchi retracts just as instantly, and in a longish apology letters explains that his intention was not to shame the sari illiterates but to shame those who associate the sari with the image of an ‘Auntyjie’. The matter rests. And then, in the last week of February, Sridevi, the ultimate diva of Indian silver screen dies. Amongst the many things that people might want to remember Sri for, no one can not remember her for sashaying in solid colored chiffon saris on the hills of Switzerland in Chandni or in a sizzling blue sari on the pool side in Mr. India. She donned the sari, and did almost anything in it, with such ease that it will not be wrong to say that stars like Sridevi (and Rekha) made the sari timeless. The sari is undoubtedly a unique dress in that it is probably the world’s only garment that is simply six yards of unstitched fabric that covers, styles and yet allows ample room for functionality. To see its versatility though, one doesn’t always have to think of Sridevi, one only has to look at the humble house maid who visits a typical urban Indian household every morning, and without a single fumble or a misstep, flourishes around the house sweeping, mopping, doing dishes and cooking, all the while her sari pallu (the loose end) neatly tucked into the rim of her petticoat (or the underskirt). Can the sari become obscure? No. From Indira Gandhi style handloom and silk saris to the now popular net saris, the sari has evolved, to suit the many desires of the modern Indian woman. It has lent itself to covering and revealing, based on the whim of the wearer. When a home bound village daughter-in-law requires to cover her head all the time, the simple unstarched cotton sari will allow that, and at the same time if the fresh college graduate wants to stun her boyfriend in the best friend’s wedding, the choices are unlimited, from net saris in bedazzling array of colors, including all neon shades, to even ‘readymade’ saris, which are simply skirts to be slipped into, with the entire façade of the sari, the pleats and pallu built in them. Likewise, the creation of the padded blouses that go with the saris, eliminating the need for strappy brassieres allows for the blouses to become as much a part of the fashion statement as one would want. So the necklines vary in as many ways as there are sari-wearers. Even outside India, given the vibrancy of the diaspora and the impactful imaging by Bollywood, there are always occasions in a year, for most NRI women to air their saris, and wear them with pride whenever they do. Is the sari associated with age? It probably is, because the actual wearing of the sari entails multiple wraps around the full length of the legs, and thus it certainly keeps in check the amount of movement possible in a pant suit, or even in a simple full-length skirt lehenga. The slowing down of the physical pace, can be associated with age, grace, dignified gestures and so on. To that extent, many women, find the sari not only cumbersome to wear but inconvenient to move about throughout the day. The discomfort does appear to get exacerbated in the sweltering heat of most Indian summers. As more women now join the labor force, and need to travel for work, standing in the sun, waiting for a bus, or an auto-rickshaw, in more layers than necessary like in a sari, can certainly appear impractical. However, the durability of the sari persists, not just through time, but also through the diversity of Indian culture. The sari is worn by women of all religions, throughout India. Muslim women wear it just as often as Hindu women, and in fact the sari is the official dress of the primarily Muslim country of neighboring Bangladesh. From its iconic mention as the garment that the infamous Shakuni tried to disrobe from the queen Panchali in a public forum, in Mahabharata, to it being the official dress of the Indian contingent in modern Olympics, the sari continues to be a well settled symbol of the Indian subcontinent. That plus the fact that when worn, the sari, can hide many an undesirable body layers, means that the sari will continue to be popular amidst footloose consumption of sugar loaded Indian mithais, and fried fritters, gulped down with full fat yogurt lassis. Savory treats, paunches and tires, cover-up saris! Cheers. Can Wellbeing Drive Value for Business and Society?